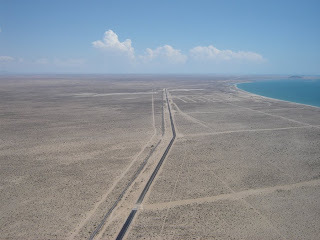 The long-awaited Coastal Highway connecting Puerto Peñasco to El Golfo officially opened on December 17, 2008, with an inaugural speech and ribbon-cutting ceremony by Governor Bours. Access to the communities along the coast has always been somewhat difficult and time consuming. However, the opening of the new Coastal Highway has made access a breeze. The highway stretches approximately 83 miles from El Golfo to Puerto Peñasco and will make life better for Mexican commuters and tourists alike. No longer will travelers need to take the Mexican 2 highway through Sonoyta. The new highway runs along the top coastline of the beautiful Sea of Cortes. This scenic coastal route not only makes drive times shorter (an estimated two hours shorter from Mexicali to Peñasco), you virtually have ocean views the entire trip. With an average water temperature of 77 degrees, the Sea of Cortes hosts over 6,000 species of marine life and some of the most spectacular beaches in Mexico. The highway has three beautiful rest stops complete with palapas and stories about the Pinacate Biosphere as well as the Biosphere in Baja Norte. The stories are in both English and Spanish and include pictures of the different species of animals that traverse the desert and mountains. For those who aren’t aware, Puerto Peñasco is known to be one of the fastest growing real estate markets in Mexico. Meaning that Puerto Peñasco is now one of the high-end vacation destinations for U.S. tourists and the new highway now provides a faster and more direct route for our U.S. neighbors, especially Californians. The potential for tourists from San Diego alone is overwhelming. With a population of nearly 1.5 million that are looking for a weekend getaway or extended vacation, they can now be in Puerto Peñasco in just five hours. 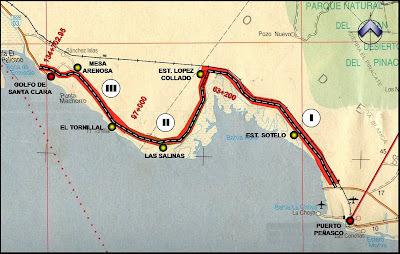 Highway expansion is also currently under construction from Puerto Peñasco to Kino Bay and San Carlos. Several miles have already been completed near Desemboque. When completed, this 375-mile highway will extend from El Golfo all the way to the southern tip of Sonora, allowing for growth and tourism along the entire coastline. If you want to expand your vacation beyond the normal tourist attractions, it is now easier and faster. Exploring Mexico by car is not only a great way to get from place to place, but you can take the time to see all the wonders northwest Mexico has to offer. A large part of the fun of visiting Puerto Peñasco is getting there. No matter if you live in Mexico or are just on vacation, come experience for yourself the magnificent new stretch of coastal highway along the Sea of Cortez. From Puerto Peñasco, you can get to El Golfo in about 1.25 hours, El Centro in 3.5 hours, San Diego in 5.25 hours and Yuma in 2.5 hours. From El Centro, Yuma is approximately 1 hour and San Diego is 1.75 hours. El Golfo to Yuma is 1.25 hours.